With the perceived failure of economic growth to tackle persistent income inequality and poverty around the world, social protection has increasingly become a preferred complementary model for addressing these challenges. Cash transfer programmes are therefore an essential constituent of social policy and seen as an important mechanism to tackle poverty, vulnerability and social exclusion. However, the multi-dimensionality of cash transfer programme impacts beyond direct economic and material benefits is under appreciated. 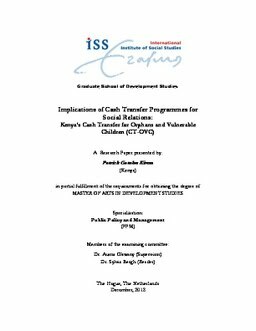 Drawing on document analysis and qualitative field research, this study considers the impacts of Kenya’s Cash Transfer for Orphans and Vulnerable Children (CT-OVC) programme on social relations. While the programme has resulted in social capital gains within beneficiary communities, it has also had perverse effects that have simultaneously engendered threats to social cohesion. The negative outcomes are largely seen to emanate from programme processes, particularly the small percentage of households targeted. Ultimately the study highlights the necessity for directing focus towards a comprehensive social protection system with a universal orientation to maximise benefits of transfer programmes. Meanwhile, there is need to expand the evaluative space to take cognizance of the range of impacts engendered by such programmes, including relational outcomes.